I've read both of Jennifer's previous books and adored them. I can't wait to check out her newest offering. A nice pick Alison! I'm excited for this one as well. 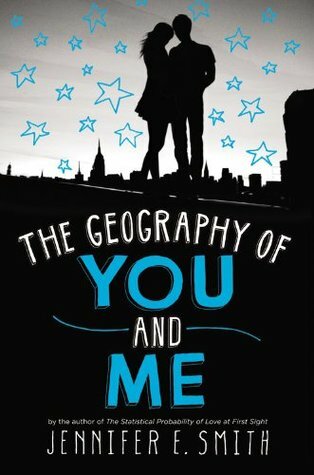 The Geography of You and Me sounds really touching, nice pick! This sounds so cute! I can't wait for it to come out:) Great pick! I just finished one of Jennifer's books and I loved it. This type of books isn't something I usually read but I really enjoyed reading it so I'd love to get this one as well. I hope you enjoy reading this one when it comes out. Seeing a lot of this one lately! Hope you enjoy it too! Nice pick this week. I should read the first book soon. Ooh, I can't wait to read this! Great choice. I hope we both enjoy reading it. Seeing this one on a lot of blogs today. Really fabulous choice Allison. Oh yes! Love Jennifer Smith's books and this one sounds great and has an amazing cover. Doesn't Jennifer Smith get the best covers?! I'm excited for this one, too. This sounds sweet! I loved her first book, was a little meh about the second, but this sounds amazing!